"And He gave us this land, a land flowing with milk and honey". Desserts such as cheesecake or blintze are eaten on the festive Jewish Holiday of Shavuot. This classic cheesecake is especially delicious with the strawberry coulis drizzled over the top. Preheat the oven to 300°F (150° C). Grind the graham crackers (sweet biscuits) in a food processor to fine crumbs, or use 8 ounces ready made graham cracker crumbs in box. Place in a mixing bowl. Pour the melted butter over the crumbs, and stir to combine. Press into an 8 or 9-inch springform pan, lining the base and sides. Place the cream cheese, ricotta cheese and sugar in a food processor and process until smooth. (Alternatively you can use an electric mixer.) Add the eggs, 1 at a time, mixing well after each addition. Transfer to a bowl (if using a processor) and fold in the flour, sour cream, lemon juice and lemon zest. Pour into the crust-lined springform pan. Place the springform pan with cheesecake batter inside a larger baking pan, and fill the larger pan carefully with one inch of water and place pan in 300°F/150°C oven. (This method is called a "WATER BATH" which helps your cheesecake bake evenly and to prevent cracking.) Bake for 1 hour, or until the cheesecake is set in the middle. Turn off the heat and leave in the oven for another one hour, with the door ajar. Remove from the oven, take cheesecake pan out of water bath, and set aside on cooling rack to cool completely. Refrigerate for at least 2 hours. Remove cheesecake from refrigerator and release sides of springform pan. Transfer cheesecake to serving platter or cut into individual slices. 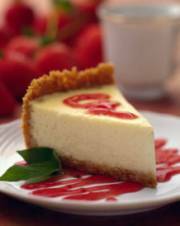 Decoratively drizzle each dessert plate and slices of cheesecake with Strawberry Coulis. In a blender or food processor, puree strawberries with sugar and lemon juice. Taste and add more sugar or lemon juice as needed. Strain seeds from strawberries, if desired. Cover and refrigerate coulis until ready to serve cheesecake. It looks nice, I will definitely try it. Thank you.